It's 10:03 in Tel Aviv, Israel right now. Beach View A nice view from the Sheraton Tel Aviv Hotel & Towers. 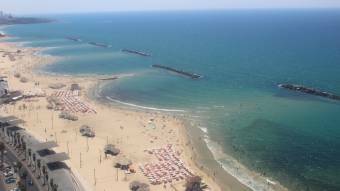 Tel Aviv: Beach and Marina, 0 miles away. Ramat HaSharon: Weather in Ramat HaSharon, 4.7 miles away. Rosh HaAyin: Weather in Rosh HaAyin, 9.4 miles away. Jerusalem: Livestream Western Wall, 32.1 miles away. Jerusalem: Weather in Jerusalem, 32.1 miles away. Petra: The Treasury, 126.9 miles away. Petra: Visitor Center, 126.9 miles away. Beirut: AUB Main Gate, 131.2 miles away.